There is a loose elegance in the scratchy guitars, rattle and hum push of drums on Why There Are Mountains by Staten Island’s Cymbals Eat Guitars. With a nice tumble dry emo indie punk sound, tunes drive by relentlessly like 16 wheelers ruffle dust on a highway, leaving whatever they pass affected. “And The Hazy Sea,” begins with loosely executed wah choruses of voices and breaks into a sunny day wall of guitar harmonies. Lead singer, Joseph Ferocious interjects with a brazen jaunt of punkish vocals as his voice scrapes against itself creating a wonderfully riotous mood. “Cold Spring” starts with dark vocals and a slow tempo sway that is accented by pops of guitar and elegant strains of violin. The constructive quality of each song is quite astounding. This is very much an indie rock album that contains its arrogance in the thrill of each layered harmonic piece of instrumentation against a brash scrappy assault. Experimental oddity and time changes do nothing to work against the overall appeal and comfort of crashy guitars, shaky reverb and antsy vocals. 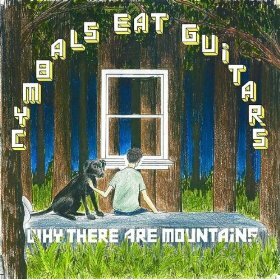 The tidal wave of all indie royalty is compacted on Why There Are Mountains, and in such a guitar versus drum warfare, the whole album wins.